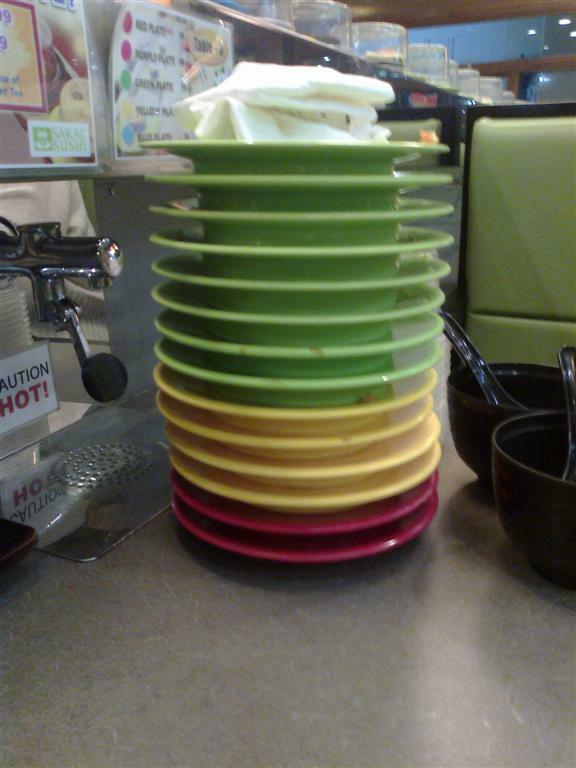 On a whim, my wife and I decided to try out the conveyor belt-run sushi buffet at Sakae Sushi MOA. 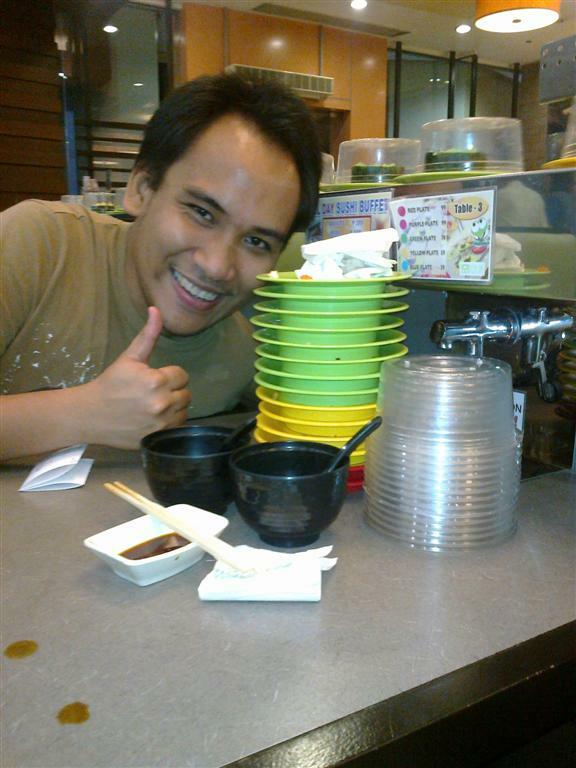 For unlimited sushi you only have to dish out 399 with free bottomless red ice tea and miso soup. This is going to be a quick review by the way because we only tried the sushi and nothing else. 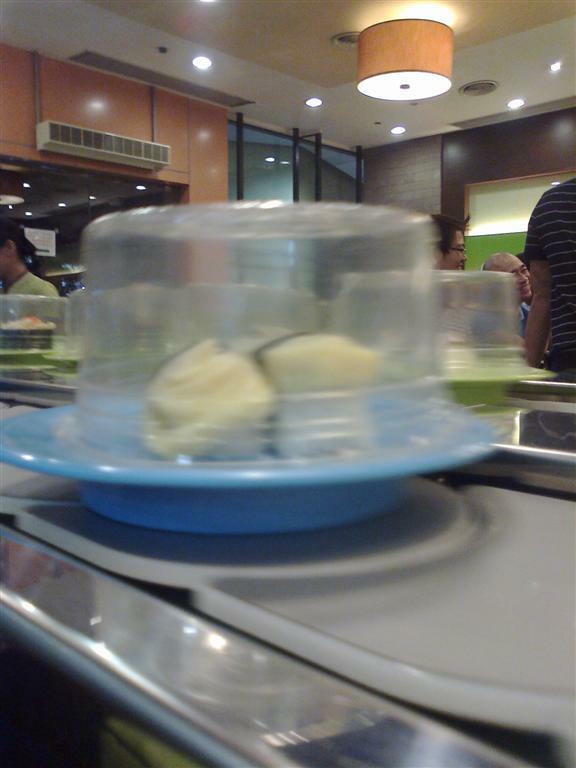 I think the novelty of this sushi bar lies with the conveyor and the fascination of the diner over this mechanized wonder. The tamago (egg) sushi, I always try this sushi because it’s supposed to be the most basic. Sakae’s Tamago was just right, it was moist but not soggy and definitely not dry unlike those from other restaurants. 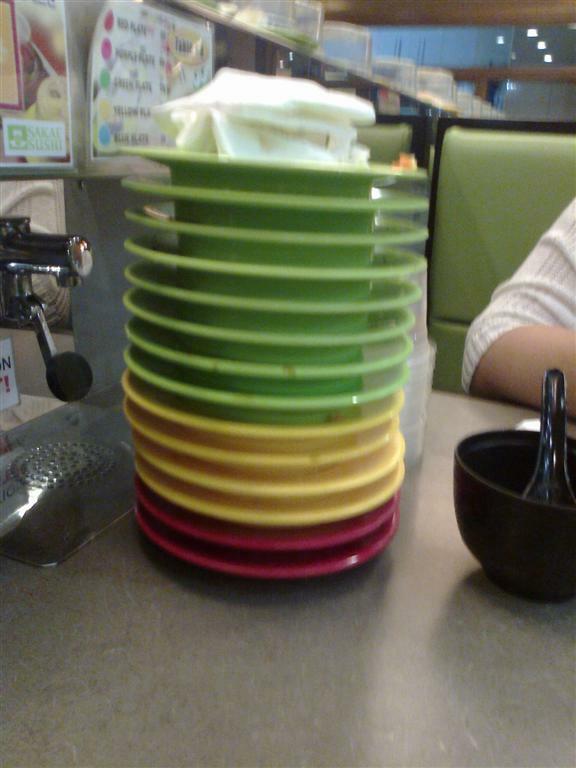 My consumed plates, the color determines the price of the sushi. Retail price ranges from PhP 40 to PhP 90 each. I challenged myself to have it stacked as high as possible. Spicy sushi, I don’t what it’s actual name is. It had mango, cucumber, kani and some other vegetable but with chili flakes surrounding it. It was good and really spicy, there was a slight crunch to it, which gave it even more texture coupled with the flakes, it had a nice kick to it. Tamago sushi. They had the one with the shrimp, another with just roe and nori (seaweed wrap), also with kani. I think they had about 10 to 15 varieties. The final tally. I was really hungry when I came in and it really filled up my tummy. 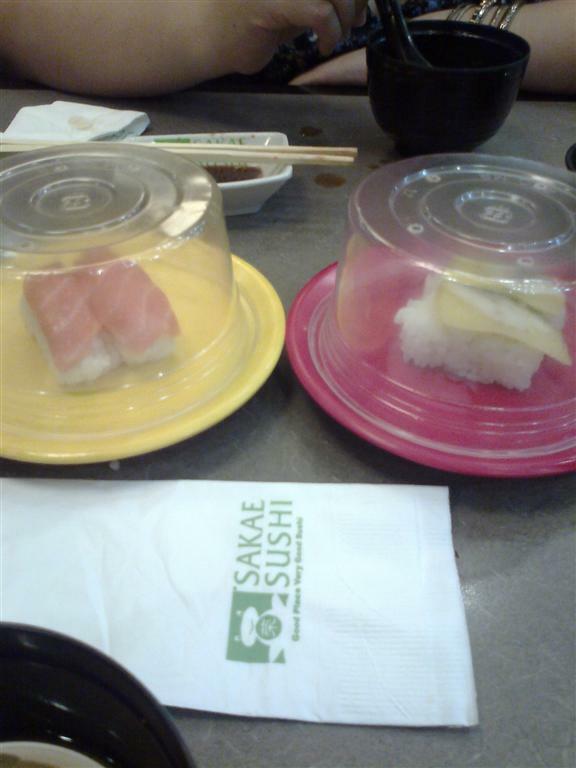 I noticed that they were quite strict with the leftover though and that they did not include sashimi in the buffet. 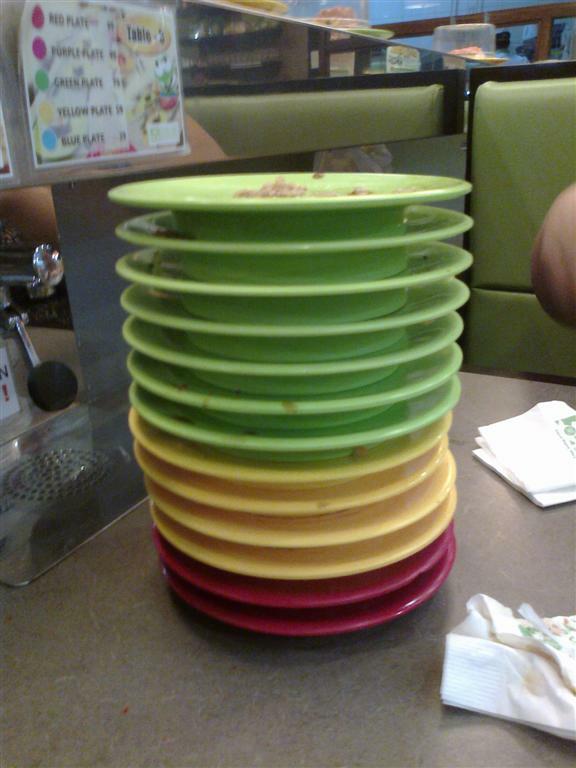 I would definitely come back to Sakae for a quick and filling sushi binge. The taste was decent enough and the they used fresh ingredients albeit there was too much rice in some of their offerings. 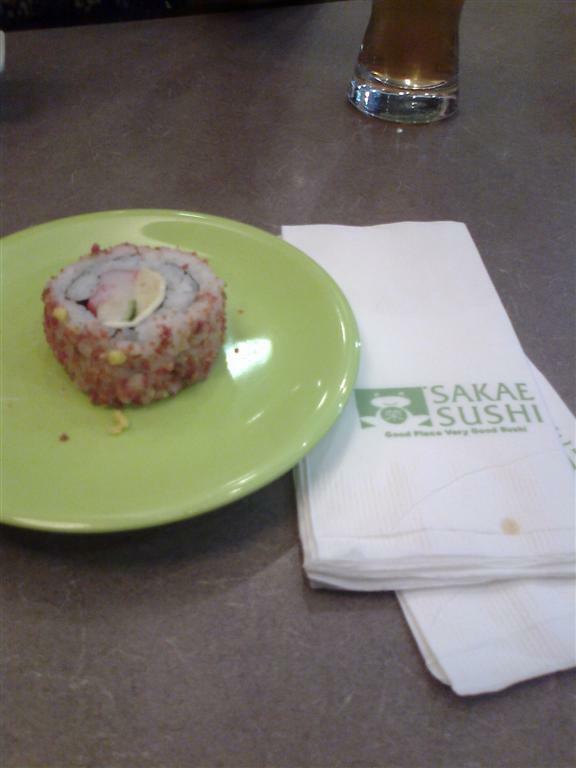 MFB would rate this 3.5 out of 5, for its price point and variety Sakae Sushi is one Japanese Sushi Bar you should try at least once, the taste, ambience and service are good enough to merit another visit. The only letdown for me is the lack of any Sashimi offerings, I was expecting that because salmon and tuna is on the expensive side. 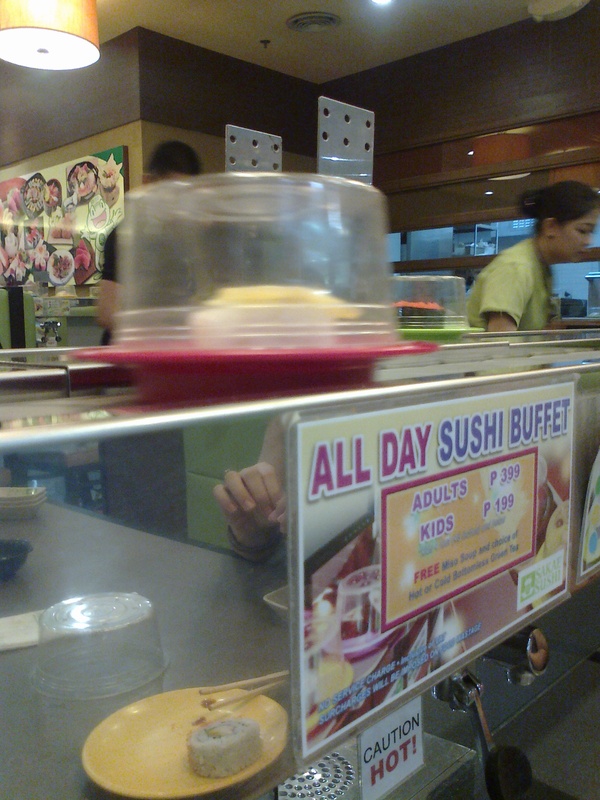 This entry was posted in Asian Dishes, Japanese, Mall of Asia by manilafoodblog. Bookmark the permalink. onga eh, kung may sashimi solve na solve na 🙂 naisip ko tanggalin yung tuna at salmon dun sa sushi pero strict sila sa left-overs so kailangan din maubos yung kanin. tama! marami ding ganyan sa Singapore di ba?